The Monastery of Batalha is a Dominican convent and a masterpiece of Gothic art. 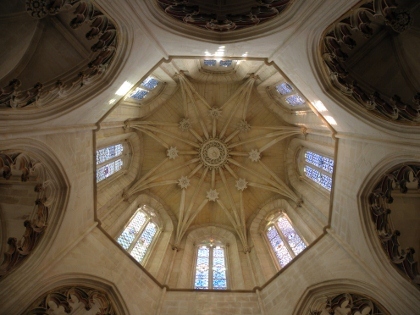 Its late Gothic architecture is intermingled with the Manueline style. The ornate convent has been put up in limestone. It amazes the onlooker with its profusion of gables, spires, pinnacles and buttresses. The convent was built to thank the Virgin Mary for the Portuguese victory over the Castilians in the battle of Aljubarrota in 1385. It took over a century to build, starting in 1386 and ending circa 1517, spanning the reign of seven kings. It took the efforts of fifteen architects. The Monastery's Founder's Chapel (Capela do Fundador) became the first royal pantheon in Portugal. It holds the tombs of king João I and his wife Philippa of Lancaster, and their sons prince Dom Pedro, Henry the Navigator, Dom João and Dom Fernando. This monastery lies at the heart of the town of Batalha. It borders a large square, where during the Saturday afternoon that I visited people were enjoying themselves on rollerskates and loud Christmas songs were played. There are also many cafés and souvenir shops, a sign that this is well on the tourist trail. The building itself is colossal. It is made out of stones in a rare yellowish colour, added by lots of grey on top from dirt. The pigeons love it too. The first thing I did was walk around it slowly. It is an impressive but also weird construction. The seemingly endless decoration scheme is really over-the-top. Just as with the Hieronymite Monastery in Lisbon, I cannot say that I am becoming a big fan of this Manueline style. Near the front end there's a huge black equestrian statue, commemorating the battle of Aljubarrota in 1385 - which is why the construction of this monastery was started at all. 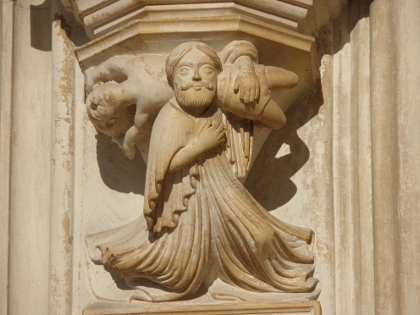 The main portal also has the most beautiful carvings of little angels, saints, kings and other holy men. The interior of the church is much more sober. Only the stained glass windows lighten up the atmosphere. Although entrance to the church itself is free, I bought a ticket for 6 EUR to see the rest of the monastery. The cloisters however I found unremarkable, especially after having seen those at the Hieronymite Monastery the day before. I ended up at the Capelas Imperfeitas, clearly a later addition. I could only look at them from a fair distance, as the entrance was closed due to a slippery floor. Finally I was back at the front entrance of the church again, where directly to the right just after entering lies the Capela do Fundador. This is the royal mausoleum, with tombs placed in the walls and that of one royal couple (king Joao I) in the center. Just as the Capelas Imperfeitas, this space has some undefinable touches of Indian architecture (maybe it's the curvings, or the elaborate decoration). The royal tombs here are all finely detailed. The Cloister of King Afonso is undeniably beautiful and with a blue nearly cloudless sky, it was very pleasant. Truly, a historic site that I will miss walking from within, wonder to wonder, and then arriving to the unfinished chapel and finding myself smiling. The detail in the later open-air chapel was astounding and a bit absurd! My visit took around an hour, but by the end, returning to the car, my wife and I were just full of enjoyment of the drive, the history, the gorgeous weather. No complaints. 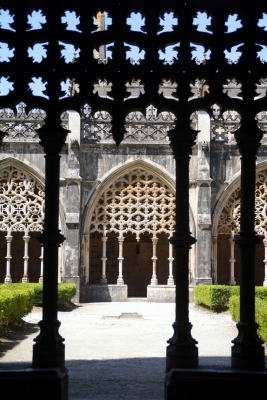 Much has been stated here about "Manueline" or Portuguese late Gothic style architecture. While it surely is over-the-top, this description cannot even begin to be imagined when you compare how over-the-top every building in Sintra is, no? Can something over-the-top still be admired and charming? Surely, yes. Sintra, despite its vanity, is a lovely place to explore. So I don't really understand this critique, but this monastery which just passed its 500 year anniversary is certainly a religion gem worth visiting and seeing for oneself. 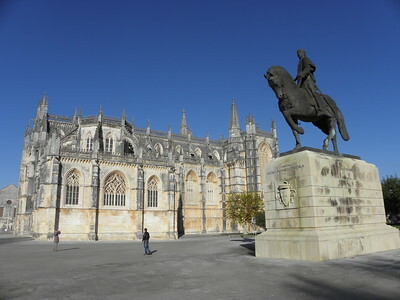 I arrived in Batalha around lunchtime on a Sunday in May 2018. Coming from the rather sleepy town of Alcobaça, the quite lively Batalha was a pleasant surprise. The service was just over and the squares around the monastery were crowded with churchgoers, locals and tourists. I decided to wait a bit until the crowds had dispersed and took a snack in one of the nearby restaurants. After lunch and after a walk around the outside of the large monastery complex I entered the church. Compared with the exuberant exterior, the interior of the church is plain and elegant, not much different from Alcobaça. But this impression changes when you visit the monastery. 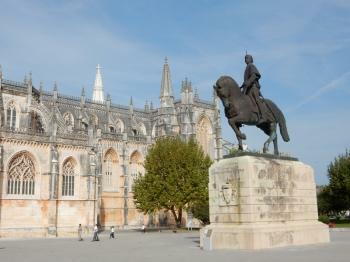 It is famous for the Gothic-Manueline architecture. The opinions differ widely: "magnificent gem" or "over-the-top decor". I tend more towards the latter, nevertheless, it is fun to explore all the architectural details and the opulent decor. 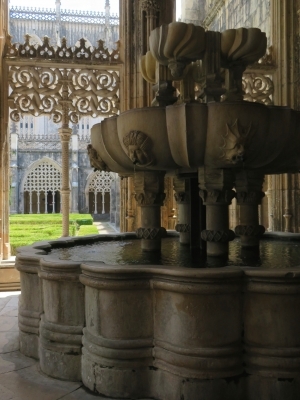 A highlight of this style is certainly the Royal Cloister or Clastro Real (photo): the combination of Gothic arches and Manueline tracery supported by slender columns is unique. 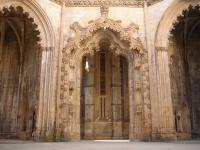 And of course the Capelas Imperfeitas, in particular the Manueline portal, more decoration is hardly possible. However, my favourite room was the Chapterhouse: a large, rectangular room with a single star-shaped rib vault, without a supporting column in the centre. A daring construction at that time, but with an impressive result, both aesthetically and technically. After leaving the monastery, I went back to the entrance to have a final look at the details of the façade and the portal of the church. Well, the Manueline architecture is definitely not my favourite style, but it was a highly enjoyable visit and it was instructive to directly compare Batalha with Alcobaça. Both have all the elements typical of a monastery, concept and structure are similar, but the artistic implementation and the architectural solutions are very different. In the late afternoon I went to Tomar and was looking forward to the third World Heritage monastery in Central Portugal. 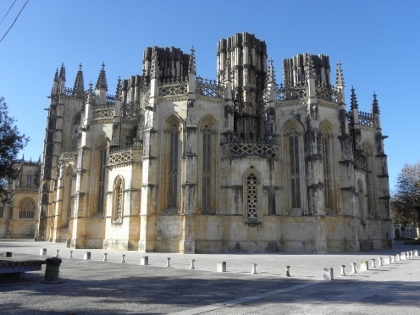 I visited Batalha as part of an organized daytrip from Lisbon (together with Alcobaca, Óbidos, Nazaré and Fatima), so, just like in Alcobaca, we only had a limited amount of time available there. The monastery is much more impressive from the outside than Alcobaca, but we only had a chance for a quick look through the interior. The complex was built to commemorate a 14th-century battle against the Spanish and then served as a burial place for several kings and nobles. It is similar to the Hieronymite Monastery in Lisbon in its impressive, but a bit over-the-top Gothic/Manueline architecture. I visited this WHS in August 2014. I spent half a day here and although I thought that 4 WHS monasteries/convents in an area of about 200km was going to be too much, I was wrong. After Tomar, the monastery of Batalha turned out to be my favourite. I had bought the convenient combined ticket of Tomar+Batalha+Alcobaca from Tomar which not only meant that I saved 3 euros but more importantly I didn't have to wait in the queue. The church entrance is free but the combined ticket will allow you to visit the incredible cloister carved in the Manueline style. The church exterior is also over-the-top with plenty of unique gargoyles to gaze at. The highlight of my visit though were hidden neatly behind the church - the unfinished chapels (picture). The intricate carving is truly world class. I loved Alcobaca for her grand simplicity, a perfect combination with the delicate beauty of the church at Batalha. After getting all cathedraled-out in Spain, Alcobaca and Batalha sure proved to be welcome change from all the artistic excess of Portgual next-door neighbor. I loved all those fantastic traceries inside the church and its just too bad that 600 years on, this church isnt finished yet! Mosteiro de Santa Maria da Vitoria is another royal monastery built as a symbol of victory over Spain similar to the one in Alcobaca, but these two monasteries are totally different in style as Alcobaca is pure gothic and Batalha is unique Manueline. Batalha monastery is very beautiful with stone carving in Manueline style and one of the best after the Monastery in Belem. The Royal Cloister's arches are one of the prettiest I ever seen, but the real jewel is the famous "Capelas Imperfeitas" which is the royal mausoleum which reminded me to India's amazing stone carving! Seeing Batalha is a great joy to see the exceptional work of art and one of my favorite places in Portugal. For historical interest, this monastery is the resting place of Prince Henry, the navigator who played a major support for discovery age. His tomb is in the 'Capela do Fundador' room right next to main entrance. Batalha monastery also has the tomb of unknown soldiers from WWI so this place is very important for Portuguese army and you can see some ceremonial guards walk around the area. So please show some respect when seeing this place. When I visited in 2002 there was a wedding in progress. The choir's voices were surreal. A visit during a mass would be worthwhile for the opportunity to hear the incredible acoustics of the cathedral. The sound was unforgettable as was the monestery. It is well worth the visit especially for anyone wishing to learn more about Portugal's history and architecture. The unfinished chapel/tomb is the last stop on the tour and well worth the effort. It's beautiful. 211 Community Members have visited.